Not many humans understand energy the way they truly should. Do Humans take for granted what energy means to them? Fuelling up the car with gasoline so it has the energy to get you from A to B, plug in the washing machine so it has the energy to wash your dirty clothes, turn on the light switch so you have the energy to light up your darkened living room, these are some examples of how humans take energy for granted. 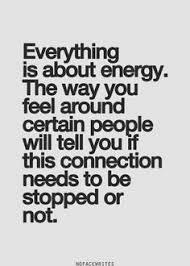 What about the energy that might attach itself to you after spending an evening amongst a crowd of people, some of those people you might know but maybe some you don’t? What about the energy that might follow you home after an hour or so in the grocery store? Not to mention the energy that might have the most negative undertone of all, the dirty energy you can’t seem to shift after a difficult day at work? If more people knew more about the energy which is a constant around their physical body, other than the energy they take for granted, they may find they are able to keep themselves feeling happier and healthier. What about the energy which keeps your mind so active somedays you feel like you are losing your mind, every single one of your thoughts (and you have between 60,000 and 80,000 on average a day, most of which are negative) are attached to an energy within you. In fact, according to cognitive neuroscientists, we are conscious of only 5 percent of our brain activity (our thoughts) in a one day period. This means 95 percent of our brain activity is beyond our conscious awareness, this is unbelievable, so much for being in the ‘now’ moment. Everything is energy, you may have heard this before but have you ever invested time in giving it some proper thought? For example, if you spend an hour with a person who is negative how does it make you feel? If you spend an hour in nature by yourself how does this affect your vitality? We can’t do much about the negative energy that is a constant in our lives, mostly the energy from the dysfunction that comes from many of the inhabitants of this planet but we can do something about our own personal energy to at least raise our vibration for our own physical, emotional and mental health and that is to become wiser about Human energies. The key to your personal growth and well-being lies in the subject of Human Energy, pay more attention to your own thoughts, and certainly pay more attention to the company you keep.